What is a Cinema Organ? Paul Kirner commenced his professional career in 1964 after tuition on church pipe organ at Ratcliffe College. He studied entertainment style with recording and broadcasting organists Charles Smart (BBC) and Ena Baga on Hammond Organ. 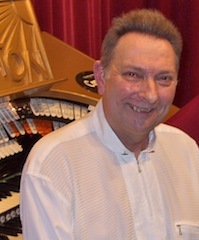 He has performed throughout the U.K. as solo summer season organist and entertainer at premier resorts including Skegness, Douglas (Isle of Man) and Aberystwyth. He has also completed winter seasons at major theatres for pantomimes, revues and variety shows as organist and musical director. Paul toured theatres and clubland for many years with his own musical, vocal and comedy trio during the 70’s and 80’s. He has played at many of the popular concert venues on the theatre organ circuit and has also played for many special concerts and charity dance nights at the famous Blackpool Tower Ballroom.